Are you a certified chocoholic? Then Chocolatier is the store you're looking for! My mother and I are big lovers of chocolates. We always walk by Chocolatier which is located at Abreeza Mall and never got the chance to try their delicious and mouth watering food and alas, finally we did. Mom ordered and we waited. Btw, we decided to sit outside to breathe fresh air which was very relaxing and comforting. Ten minutes of anticipating wait our orders arrived. 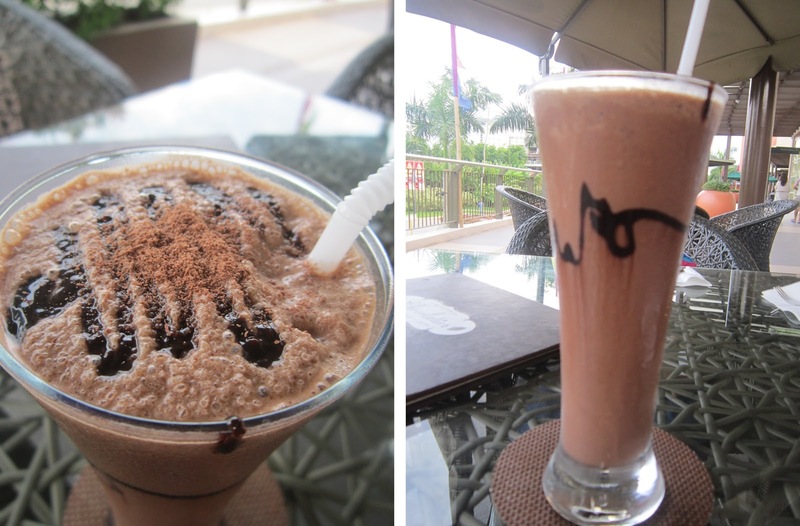 Nutella Chocolate Drink; Loved this drink so much because 1st of all I'm a nutella lover! And nutella in a drink? Amazing. Dark Chocolate Drink; Enjoyed taking sips of this awesome drink. This was tastier than I imagined and worth your money. Sweet Revenge; One of their best sellers! Dark chocolate molten lava cake made from Europe's finest Lindt Excellence Dark 70%, filled with oozing sweet and vengefully spicy chocolate lava served with vanilla ice cream. Super sweet and it tastes yummier than it looks! As Maitre Chocolatier celebrates their 2nd anniversary they have an ongoing promo which is Buy 1 Get 1 on any chocolate drinks, coffee and cocktails every Monday to Thursday. Promo runs until November 15, 2012.